Engineering giant Rolls-Royce swung into loss last year, as it increased the charge for fixing problems with its Trent 1000 engines. The company also took a charge of £186m after Airbus said it was stopping production of its A380 superjumbo aircraft. Rolls-Royce reported a pre-tax loss of £2.9bn for 2018, down from a profit of £3.89bn the previous year. The firm also withdrew a bid to supply an engine for a new Boeing plane. The company's shares were the biggest fallers on the FTSE 100 - down more than 4% at one point. Underlying operating profit, which strips out the exceptional items, jumped 71% to £633m, up from £317m in 2017. "Underlying financial results are ahead of expectations, with good growth in profit and cash flow. Following the restructuring we announced in June last year we are starting to see the crucial behavioural changes needed to sustain our momentum," chief executive Warren East said. The company announced last summer that it was cutting 4,600 jobs over two years as part of a major reorganisation. Last year, a fault with Rolls-Royce's Trent 1000 engines grounded planes at British Airways and other airlines. 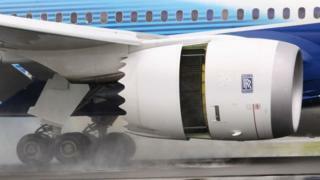 The engine powers Boeing's 787 Dreamliner. At the time, the company said the issues would take "some years" to fix. It said parts in its Trent 1000 engines were wearing out faster than expected but that it "had a solution" to the problem. In its results statement, Rolls-Royce said it had increased the charge it had taken on fixing problems with its Trent 1000 engines to £790m, up from £554m. Rolls-Royce also said that following the Airbus decision to stop delivery of the A380 in 2021 it had assessed the impact on its Trent 900 engine programme and associated customers and suppliers. As a result it had recorded an exceptional item of £186m in the 2018 results which "relates to onerous contracts, tooling write-offs and the acceleration of depreciation and amortisation on associated Trent 900 programme assets". However, it has said it will no longer compete to supply engines for Boeing's proposed new mid-sized jetliner to fill a gap between the narrow and wide-body aircraft. "We are unable to commit to the proposed timetable to ensure we have a sufficiently mature product which supports Boeing's ambition for the aircraft," Rolls-Royce said. Hargreaves Lansdown equity analyst George Salmon said many parts of Rolls-Royce were operating more efficiently than they had in the last few years, "but Warren East hasn't quite got Rolls-Royce firing on all cylinders". There were "bright spots", he said, such as a £611m net cash position and £568m of free cash flow, "a critical figure for Rolls since management put it front and centre of the investment case". However, he added: "While Rolls deserves credit for freeing up cash by changing its supplier terms, much of the improvement is being driven by extra upfront payments and £70m of restructuring costs have been excluded. "While these results look strong, the multitude of adjustments and mitigating factors mean we think the champagne will have to stay on ice for now."